Mix cookie crumbs and butter. Press onto bottom and up side of 9-inch pie plate. Size-Wise: Sweets can add enjoyment to a balanced diet, but remember to keep tabs on portions. 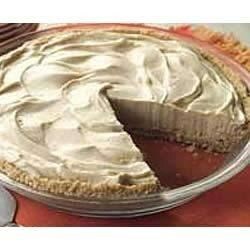 Substitute: Substitute 1 HONEY MAID Graham Pie Crust (6 oz.) for the homemade crumb crust. How to Easily Crush Cookies: Crush cookies in resealable plastic bag with rolling pin or in food processor. I make this all the time. If it's too rich with the nutter butter crust or if you don't have time, a pre-made pie crust works well too! I made this pie for my family and they loved it. It was very easy to make. If you have kids and a husband that love Nutter Butter cookies then you will love this recipe. Easy and delicious. This now a family favorite!